Hope Awards Dinner administrative volunteers help Calvary prepare for our biggest fundraising event of the year, which usually takes place in May. Calvary’s development team begins prepping for the Hope Awards Dinner months in advance, and are always looking for a few dedicated volunteers to help pull all the details together. As a Hope Awards Dinner administrative volunteer, you should expect to help with various tasks such as addressing and stuffing invitations and thank you notes, entering donations into our donor database, calling and emailing local businesses and requesting auction item donations, and various other event-related tasks. 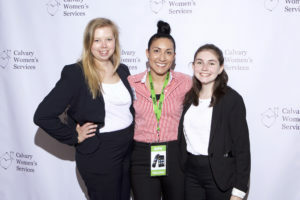 Volunteers for this role should have strong written and oral communications skills, the desire to reach out to businesses and the community on behalf of Calvary, some event management experience, and an excitement for Calvary’s missions and goals. We expect these volunteers to make a commitment to come on site once per week for three hours, during business hours, from the beginning of March to mid-May. Volunteers may also be asked to volunteer at the Hope Awards Dinner itself, which takes place on a weekday evening. On site once per week for three hours, during business hours, from the beginning of March to mid-May. Ready to support Calvary’s Hope Awards Dinner?